Ohhh, Simon Rich, how I love thee. Rich first hooked me with 2013's The Last Girlfriend On Earth, a short story collection full of brief, whip-smart stories on relationships and gender. Every satirical eye-ful was something special, and Spoiled Brats lives up to the hype of that initial collection. *I received a complimentary copy of this book from the publisher for review consideration through some service or other that I can't remember right now. At the beginning of Spoiled Brats, I feared the magic might be gone. I mean, really, could anything live up to the surprise of The Last Girlfriend on Earth? But then the magic slapped me in the face. This collection is similar to his previous work for its brief stories that pack a punch, but this time Rich is examining and critiquing Millenials...from helicopter parents to hipsters right on down to jazz blogs and artisanal pickles. My very favorite story was, "Sell Out," about a Jewish immigrant named Hershel Rich works in a pickle factory. One day he falls into the vat of brine, the lid is closed, and is opened years down the line when everyone he's has known is gone. BUT, he has a 27-year-old great-great-grandson named Simon Rich! The two men are the same age since Hershel was preserved in the brine, and suddenly outdated ideologies clash with Millenial entitlement. It's hilarious, thought-provoking, and remarkably brainy. There are quite a few touches of Rip Van Winkle in this little collection...some overt and some less so. There's also a lot of taking aim at family dynamics and old-school vs. new-school morality. There are some happy endings, some wonky endings, and some cringe-worthy moments, but I just can't get over how clever it all is and that in the midst of its cleverness it's still charming, good storytelling. I gotta hand it to you, Simon Rich, you might be my new author crush. I think we should. He deserves it. Oh yes, Simon Rich is terrific! I loved this book too! I discovered What In God's Name in my stacks and hope to get to it soon. Isn't he? And you're so lucky to have some more of his work on hand! I need to seek more out. Sounds very clever! I'm starting to have a short story moment--I'm reading Atwood's Stone Mattress collection right now. It's so great to take a break from novels and just read a nice, self-contained piece of short fiction at night. I just put in a request for my library to buy a copy of this, and put me at the top of the queue! These sounds amazing! "Sell Out" sounds especially worth reading. I always get really nervous when I start a book from an author whose last book I really loved. Glad the magic kept going in this one for you! They're all really really good. "Sell Out" did win a special place in my heart, though. So clever, and it's got a great ending, too! I loved The Last Girlfriend on Earth, so I'm excited to hear Spoiled Brats is just as good! Yep! I think you'll love it, Leah! I love short stories! 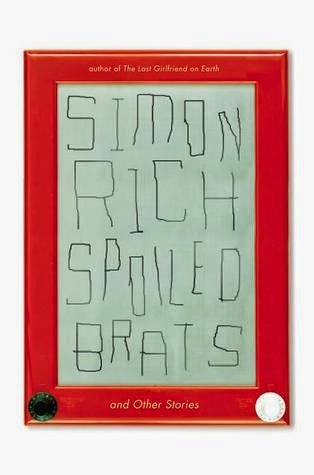 So, this Simon Rich sounds right up my alley :) I'm so glad you posted about this book!! YES, YES, YES! Add him to your wishlist, stat! This is going onto my TBR list IMMEDIATELY. Thanks for the review! I'm so glad to hear it, Randall! I'm looking forward to reading this - you and Shannon (RCR) have both convinced me with your reviews! Yayyy! I love it when we bring someone over to the dark side. Whahahaha! You've got me sold. Heading to add it to the wishlist right now. I'm pretty sure this is one that I collected on my last visit to my favorite book store (the owner is a friend who lets me browse the ARCs in back since I spend an obscene amount of money there anyway). I'm not often a huge fan of short stories though so I may have passed on it. Now I need to go look in my stacks! I hope it's on your stack! It's wonderful! Yep! It's a super fast read, too! I've been trying to read more short stories but they are so often uneven. This one sounds great! Very good. I hope you like it if you get 'round to it! I've heard so many good things about this one, and I've been on such a short story kick that I might have to go find myself a copy. Do it! That's me enabling.